We are a Thomas the Train loving family. Sophie discovered Thomas and his friends just before she turned two and we have never looked back. Bella loves the trains just as much as Sophie does, which has been really fun for us as a family. We spend hours in our playroom making miles of track for the engines to work and play on. We started with the wooden track, then added the take and play track and, most recently, the girls have had a great time playing with Track Master tracks and engines. The great thing about Track Master Thomas sets is that the track is larger, which makes it easier for little hands to grab and click into place. We store the miles of track that we own in a plastic tote which is dumped on a daily basis as we create and re-create the Island of Sodor. The Track Master Engines do need batteries to run, but they can be pushed around the tracks fine without batteries if you don’t want the noise. Sophie was so excited when I told her she was chosen to review the Thomas & Friends Trackmaster Risky Rails Bridge Drop train set from The Blue Mountain Mystery movie. We first saw the set when shopping in the fall and this has topped her Christmas list from day one. She was so excited that she watched the deliveries every day and when the box finally arrived she couldn’t wait to open it. I was a little concerned when I got the box opened and saw this: This is not the first Track Master set that we have put together, but it is the most labor intensive. The mountain pieces need to be securely clicked together before they will hold the track securely – and they are NOT easy to snap together. However, once you do snap them together they are not meant to come apart, so make sure you have the pieces the correct way! You also need to snap Merrick the Crane onto the mountain before you start to put the set together. Once you are ready to assemble the track make sure you have the necessary room. This track is NOT meant to come apart and be stored and rebuilt like most other Master Track sets. We started with the set on the floor and ended up putting it down in our playroom on the train table. There are instructions included which are mostly helpful, although some of the letters were not on the actual plastic rail pieces. Plan on about 20-35 minutes to get the track assembled. Once the Bridge Drop is assembled, get ready for your little engineer to have a blast. Thomas carries a large boulder up the mountain, loads it onto the zip line and watches it zoom down the mountainside. Thomas continues up the mountain, through the tunnel…..and suddenly the track is missing – and Thomas *falls* through the air and lands safely on the track below. There are a few issues that I have with this toy. The track along the upper mountain is very hard to snap into place, and does pop out from time to time. The zip line for the boulders is manual, and if you don’t line it up *just so* the carriage will not stay in place and wait for the boulder to roll down the orange slope. The track needs to stay in the exact line up, or the rail will not drop onto the track below, which means the engines will fall off the slope. Overall, this is a really fun track assembly. If your children enjoyed Blue Mountain Mystery they will enjoy re-creating the story line with the characters and watching the trains *fall* through the air and land on the track below. I do enjoy that the track itself does not need batteries, the engines make all the magic happen. 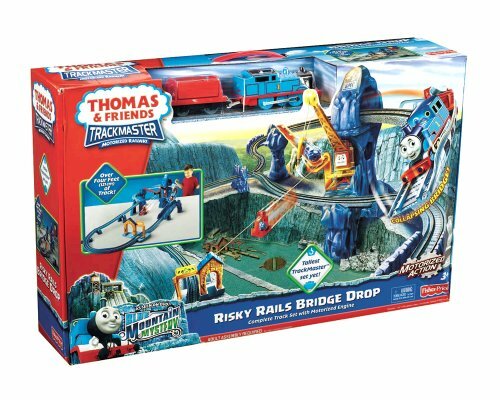 1 lucky winner will receive their very own Thomas & Friends Trackmaster Risky Rails Bridge Drop! I would love love love to give this to my 3 1/2 year old son if I won! my 3 yr old son would love this! TY! I would love to give it to my almost 3 year old that would totally love it! Thanks! If I won I would save this for my grandson! I would give this to my grandson if I won! I f I should win this will be a birthday present for grandson who will be four in Feb. If I won I would give this to my 4 year old son Bowen. I’m sure he would occasionally agree to share it with his twin sister. I’d give this to my nephew! He’d love it! My son-to-be would love this! I would save this for my 10mo. old, who already adores all things Thomas. My son is 4, he loves Thomas! I’d bring this to the kids at my local Ronald McDonald House. This would be for my Grandson, We got him a big Train table last year with Thomas the trainsets. He loves it, this would be a great addition. Thank you for this giveaway! My grandson! He would love it! I would give this to my girls. They love Thomas. I would give this to our little one Isaiah. I’d give it to my youngest son, he would love it! I would give it to my grandson Carter! I would keep this for my daughter for her next birthday! Would love to give it to my 3 year old nephew. My son! He LOVED Thomas and this would be a great addition to the set he has!!! I would give this to my grandkids. I’d give this to my nieces. Thank you for this giveaway. This would be for my 3 boys(my 2 sons and my husband lol). I’d give it to my nephew! I know he’d love it! My neighbor’s three year old son would love this, he loves Thomas the Train. I would give this to my grandson, he loves Thomas and that is all that was on his Christmas list this year. Thomas the Tank engine train sets! Thank you so very much! just sent in my info. This is awesome!